Installing the tabs is simple. You will probably not need to read all the instructions below if you understand the concept sooner. Many of these instructions are repeated in this example to ensure the system is easy to understand. 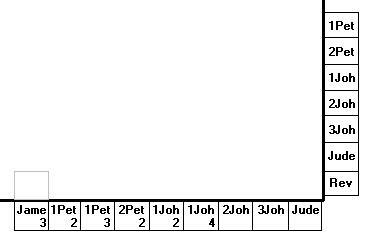 Enclosed are tabs that mark each chapter or every nth chapter for large books in the Old Testament. They are stuck to a card. For the system to operate you will need a set of book tabs commonly used and sold. I also produce a set. These need to be installed first. When the book tabs are mounted place the chapter tabs on the card's bottom section at the bottom edge of the Bible where the black arrow points. Refer to figure 1. You probably won't have to use all the tabs because if you use them all, you would have two tabs on the same page in the Bible in many cases. This would be pointless and confusing. The tabs you use will depend on your Bible. 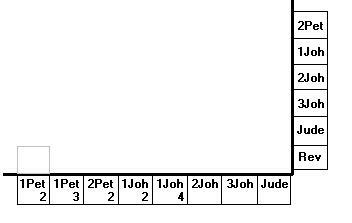 Where there are two or more chapters occurring in the two open pages visible in an open Bible, place a tab indicating the first of these chapters that appears on the two open pages. Begin by turning your Bible to the page before the page where most of the verses in the book of Jude occur. On the bottom right hand corner of the card you will see the word "START." Peel off tab labeled Jude which is near the word "START." Stick the tab labelled Jude on the bottom of the right hand page of the open Bible so that the right hand edge of the tab lines up with the right hand edge of the page. This should be near the bottom right hand corner of the Bible. The tab with the printing on it should protrude outside the bottom edge of the page while the sticky adhesive should be stuck to the page. This is shown in figure 2 where the sticky adhesive, which is clear, is represented by a lighter or grey rectangle. Tabs have black outlines. Then turn back a few pages to the page before the page where most of the verses in the book of 3 John occur. 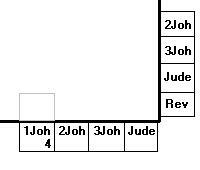 Then mount the tab labelled 3Joh on the bottom edge of the right hand page of the Bible so that the tab is just left of and adjacent to the tab for Jude, which is now on the page below. This is shown below in figure 3. Then turn back a few pages to the page before the page where most of the verses in the book of 2 John occur. Next you would mount the tab for 2 John on the bottom edge of the Bible. It will be placed just to the left hand side of the chapter 3Joh tab, which is a few pages below. This is shown below in figure 4. The diagram shows the bottom right hand corner of the right hand page. Next you will do 1 John. This is a book with many chapters. Turn the Bible to the last chapter of 1 John. If only chapter 5 occurs on the page you would mount the chapter 5 tab. If most of chapter 4 and 5 occurs on the last page you would mount the chapter 4 tab as explained earlier. You would not need a tab indicating chapter 5. There would be a tab marking chapter 4. If you want to open the Bible at chapter 5 lift the tab indicating chapter 4 and then glance forward to chapter 5. If chapter 3, 4 and 5 all occur on the last page you would need to mount the chapter 3 tab. You would not mount tabs for chapters 4 and 5. 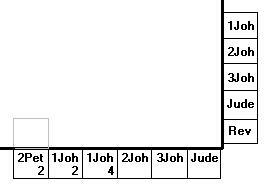 In my Bible chapter 4 and 5 occur on the last page of 1 John, so I will mount the chapter 4 tab and not use the chapter 5 tab. Turn the Bible back one page. Now you should have open the page before the last chapter of 1 John. Stick the chapter tab you chose at the bottom of the right hand page so that the tab is just left of and adjacent to the tab for 2Joh, which is now a couple of pages below. Figure 5 shows an example for my Bible where I have mounted the chapter 4 tab. Now take note of the chapters that are visible on the page of the Bible that is open. If most of the same chapter (2Joh chapter 4 tab in my case) still occurs then you will need to turn back a page or two until you see the chapter before it. This does not happen often in my Bible in the New Testament so I have not included this possibility in the examples below. In my case chapters 2 and 3 of 1 John occur on the open page of my Bible. Choose the first of these chapters, which is chapter 2 in my case. Turn the bible back one page. Now peel off the tab for the chapter you chose. Stick the tab you chose at the bottom of the right hand page so that the tab is just left of and adjacent to the chapter tab on the page below. This is shown below in figure 6 for my Bible where I have mounted the chapter 2 tab just left of and adjacent to the chapter 4 tab on the page below. Now take note of the chapters that are visible on the page of the Bible that is open. 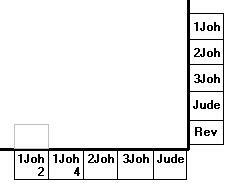 If there are still chapters for 1 john there you will need to mount more chapter tabs for 1 John. Choose the first of these chapters. In my case chapter 1 is on the first page but because the 1 John book tab opens my Bible on the same page as chapter 1, I chose not to place the 1John chapter 1 tab. This is because I will use the 1 John book tab instead of the chapter tab. You can use the chapter 1 tab if you want. You would need it if your book tabs don't open the Bible on chapter 1 of the book you want. Turn you bible back until you find the next chapters you wish to mark. It could be the last chapters in 2 Peter. This is the case for me where I will mount the 2 Peter chapter 2 tab. Turn the bible back one page so that you are on the page before the chapter you chose. Now peel off the tab for the chapter you chose. Stick the tab you chose at the bottom of the right hand page so that the tab is just left of and adjacent to the tab which you previously stuck. This was the 1Jon2 tab in my case. This is shown below in figure 7 for my Bible where I have mounted the 2 Peter chapter 2 tab. Once again I will choose not to mount the tab for chapter 1. Instead I will mount the tab for the last chapters of 1 Peter in a similar way as I did for 1 John. The next few steps are illustrated in the below diagrams. Keep mounting the tabs in this fashion until you get back to the tab with a star. This is the last possible tab you can place in this row. If used, tabs with a star would begin each row. By the time you reach the tab marked with a " * " you will be sticking tabs towards the left hand side of the bottom edge of the Bible which means you will soon run out of room if you keep sticking more tabs to the left of the one below. Therefore you will need to begin a new row. If you use the tab with a " * " it will be the tab furtherest to the left of the bottom edge of the page. The next tab that you peel off the card will begin a new row. You will mount it in the same position on the page as you did for the tab for Jude. In fact it will completely eclipse the tab for Jude. You will continue this row in the same manner as you did with the first one. The tabs which will begin a new row for the bottom edge of the page, will be mounted near the bottom right hand corner of the page. Stick in the selected tabs in your Bible from the bottom section of the card. Work your way back through the rows stuck to the card from right to left until you reach Math 13, which is just below the space on the card. Near the word "NEXT" you will see the tab for Rev 22. This may be the next tab you mount. Turn the Bible to the last chapter of Revelation, which is chapter 22. If only chapter 22 occurs on the page you would mount the chapter 22 tab. If most of chapters 21 and 22 occur on the last page you would mount the chapter 21 tab as explained above. In my Bible only chapter 22 occurs on the last page so I will mount the chapter 22 tab. Turn the Bible back one page so you are on the page before chapter 22 occurs. Stick the chapter tab you chose at the top right corner of the right hand page. Figure 11 shows an example for my Bible where I have mounted the chapter 22 tab. Now take note of the chapters that are visible on the page of the Bible that is open. In my case it is chapters 20 and 21 of Revelation. Choose the first of these chapters, which is chapter 20 in my case. Turn the bible back one page. Now peel off the tab for the chapter you chose. Place the tab just left of and adjacent to the tab for Rev22, which is now a couple of pages below. This is shown in figure 12. The diagram shows the top right hand corner of the right hand page. Repeat this process for the other tabs and chapters. In my Bible only chapter 19 is visible on the page the Bible is open. I then turn the Bible back one page and mount the chapter 19 tab just left of and adjacent to the tab for Rev 20, which is now on the page below. This is shown in figure 13 below. Keep doing this for the other tabs of Revelation. This book takes up an entire row. 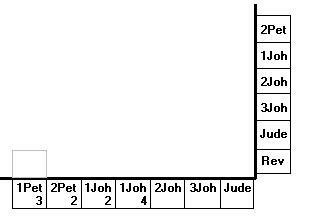 An example of the completed row is shown in Figure 14 below for my Bible. Like earlier, the tab before the tab with a star on the card will begin the next row. This would be Heb13 if you use it. You will mount it in the same position as the tab for Rev 22. In fact it will completely eclipse the tab for Rev 22. Mount tabs in this row in the same manner as the previous row. When you reach the tab labeled Ephe 6 you will begin a new row, which will be the 3rd row. You will mount the Ephe 6 tab in a similar position to the Heb 13 tab. Keep doing this for all the remaining tabs on the card. Work your way back through the rows stuck to the card from right to left until you reach Math 1. The tabs that will begin a new row for the top edge of the page will be mounted near the top right hand corner of the page. 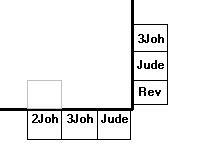 The tabs for the Old Testament are installed in a similar manner to the ones for the New Testament. They are on a separate card so people can have a choise of only buying tabs for the New Testament. 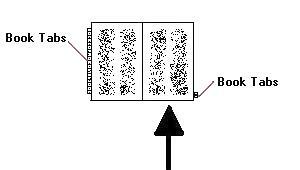 In some large books in the Old Testament the tabs only label every second or third or fourth or fifth or sixth chapter. Often in these books there are many chapters on the one page anyway. Once these tabs are installed and when you are trying to find a verse in these books you would select the tab, which is closest to the chapter you want to select. For example in a book where the tabs select every third chapter of the Bible such as 3, 6, 9 etc, you would choose the tab which is closest to the chapter you want. In this case if you want to choose chapter 7 you would open the tab marking chapter 6. You may have to go forward a page to get to chapter 7. If you want to choose chapter 5 you could open the Bible at chapter 3 and then maybe turn the Bible forward a page or you could open the Bible with the tab marking chapter 6 and then maybe go back a page. Usually it will open the Bible within a page or two of the exact page you want.